PHOTO BY VICKI JOHNSON Aidan Scully begins work on his latest piece. 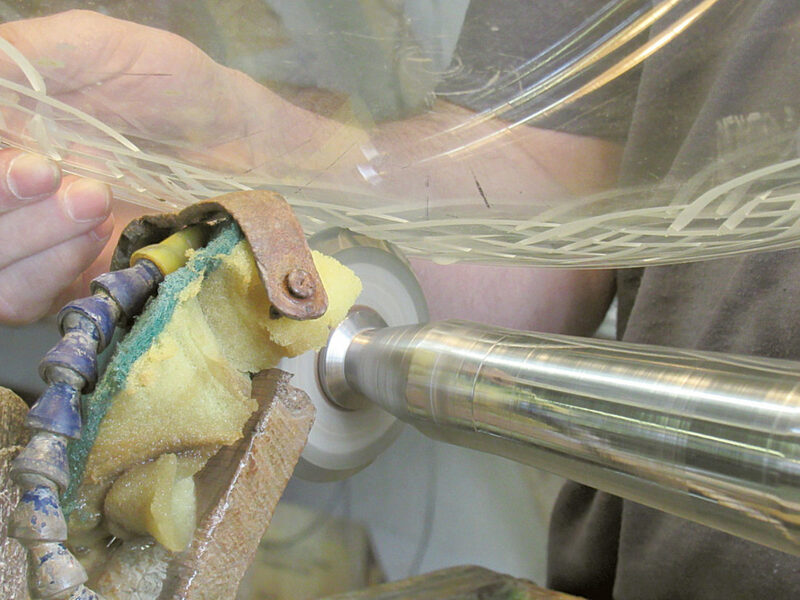 Master glass cutter Aidan Scully, of Tiffin’s Hawkes Crystal, lent his skill to the Corning Museum of Glass in Corning, New York, during its recent 150th-anniversary celebration of handcut glass. 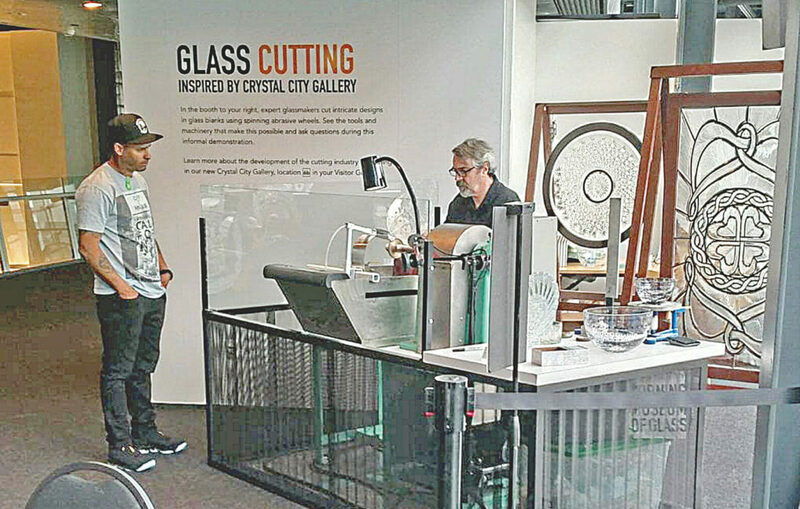 As the museum opened a new wing, he demonstrated the brilliant style of glass cutting. Scully demonstrated and displayed samples of Hawkes Crystal. PHOTO SUBMITTED Aidan Scully demonstrates glass cutting at the Corning Museum of Glass in Corning, New York. Scully said he was honored to be selected. Scully said he spent some time with the elderly cutter asking him questions about the old days. Two of the pieces Scully displayed in Corning were intricately cut windows. PHOTO BY VICKI JOHNSON A close-up look as Aidan Scully cuts glass. The era termed the “brilliant period” was 1876-1919, according to local historian Lisa Swickard. “American cut glass craftsmen excelled worldwide, and produced examples of the cut glass art that may never again be equaled,” said an online article by John C. Roesel on the American Cut Glass Association website. As one of the few remaining brilliant cutters, Scully is working to revive the art form, combining traditional and contemporary designs that appeal to the taste of modern glass aficionados, collectors and buyers. “There’s the old Hawkes and the new Hawkes,” Scully said. “There are new designs I want to introduce. 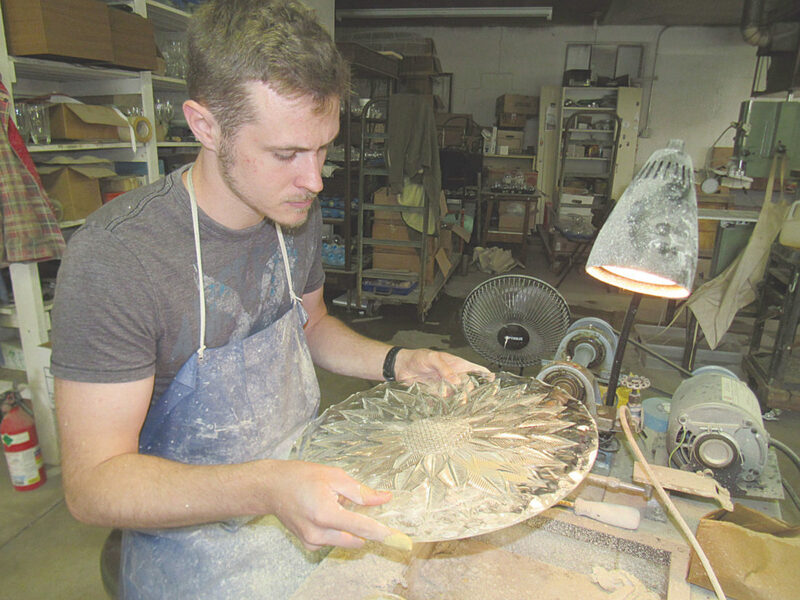 PHOTOS BY VICKI JOHNSON Apprentice Aaron Gooding polishes Efflorescence, an original contemporary Scully design. As one of three master brilliant cutters in the United States, he is well qualified to carry on that tradition. 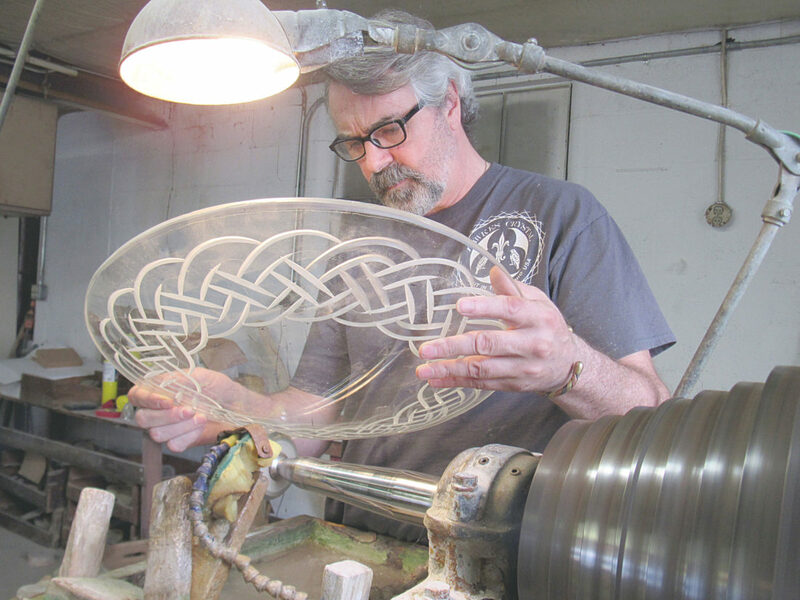 Scully was trained by a top craftsman of the era in his homeland of Cork County in southern Ireland, and is using his skills to revive the art form and the name of Hawkes Crystal. Flavin was one of the first five apprentices of famed Waterford Crystal. “The brilliant cutting came to me when I approached my mentor at the end of the four-year apprenticeship,” he said. By adding two years to his apprenticeship and showing the talent needed, his mentor agreed to teach him brilliant cutting. So far in his 30-year career, Scully’s work has been featured in the collections of the Smithsonian Institution and Toledo Museum of Art. His commissions have included pieces for former presidents Bill Clinton and Ronald Reagan, Sen. John Glenn and Pope John Paul II. Scully moved to Tiffin in 2000 to work as designer and cutter for Crystal Traditions after working in Cleveland. “What I was doing was a little bit different than was I was trained for,” he said. “When I came here they gave me free reign of design. I loved it. “Then, God rest her soul, Carol passed away and Bob passed away,” he said. Judy Smith decided to sell the business. Scully credits Andrew and Cindy Kalnow for keeping the glass industry in Tiffin. He partnered with them in 2016 to purchase the Crystal Traditions brand and glass-working equipment. The purchase included the trademark that was to become the name of the new company. “The old Tiffin Glass and Fostoria Glass used to supply Hawkes Crystal of New York with crystal and glass,” he said. “Along with the purchase came the Hawkes name and logo. So Scully and the Kalnows decided to re-open the business as Hawkes Crystal of Tiffin. “Not just anyone could do that, and actually complement the name and bring it back,” he said. In doing so, Scully said he wants to honor the Hawkes tradition while at the same time adding contemporary designs. The original Hawkes company, of Corning, New York, was founded by Thomas Gibbons Hawkes. Born in County Cork, Ireland, in 1846, Hawkes was a member of a family with a strong glass-working heritage. He emigrated to the United States in 1863. He first worked in a glass factory in Brooklyn, New York, and moved to Corning with the company in 1868. By 1890, Hawkes had opened his own glass-cutting shop, which was incorporated as T.G. Hawkes & Co. The previous year, his work had won the grand prize at the Universal Exposition in Paris. At the time, sparkling cut glass was popular in Europe, and became popular in the United States in what came to be known as the Brilliant Cut Glass Period. More than 1,000 cutting shops were founded to meet the demand. T.G. Hawkes & Co. flourished and remained in operation for 82 years. In the 1930s, Scully said the Hawkes company bought its glass blanks for stemware and other designs from Tiffin’s glass factory, which created a history between the Hawkes name and Tiffin. Through the years, T.G. Hawkes created more than 100 patterns, the most famous being the Nautilus, Chrysanthemum and Queens patterns. “Ironically enough, after all these years, it comes back into the hands of another man from Cork,” Scully said. The new Hawkes Crystal has created a team working to carry on the Hawkes name, but also infuse it with Scully’s style based on traditional Hawkes designs. “It’s all about team,” he said. “No one person can do it alone. Once you have a good team together, there’s nothing you can’t conquer if you keep together and keep going straight. Today, Scully is working to honor the tradition — not by reproducing original Hawkes designs revered by collectors, but to use the original patterns and shapes as a basis for a new modern collection of contemporary pieces, designed and hand cut by the artist just as they were in 1889 by T.G. Hawkes & Co. designers. “The old designs are intricate and take a lot of time to design and cut,” he said. “This generation doesn’t seem to have a taste for that anymore, so we have to adjust. “We’ve gone from spending weeks and weeks on a piece to spending hours and hours on a project,” he said. He said some projects still take weeks of work, but there are fewer of them. Another difference between the old and new Hawkes is technology. Scully said the power of today’s social media provides a method of reaching large numbers of people. He said he recently was cutting a Hawkes piece in the traditional Nautilus design for the Corning museum. “It was on Facebook for 25 hours before it sold,” he said. “So I have to make another one for the Corning museum. After two years in business, he said people are already aware. As Hawkes Crystal looks to the future, Scully said his goal is to create products that are world renowned. Not only does he want to revive the art form, he wants to revive the number of cut glass artists. For two years he has been training Tiffin native Aaron Gooding, a 2011 graduate of Columbian High School. Over the next few years, he would like to increase the number of apprentices he teaches to four or five at a time. “Hopefully within the next year or so I’ll take on another one,” Scully said. “Aaron can start working with him a little bit and he will oversee the work. The apprentice program is method of teaching young people how to produce a high-quality product that’s made in Tiffin. It’s a four-year program, and then two more years to become a master. His apprentice program will be a bit different from how he was trained, he said. That’s the difference between a small shop and a larger one, he said. Scully said learning never ends. It’s passion that keeps Scully working day after day. Scully said he likes the path his life has taken. “You go down many alleys in your life, and then go back and get on the main road again,” he said. “That’s the beauty of it. There’s a lot of struggles and there’s a lot of triumph in it. He said it’s exciting to join the names of Hawkes and Scully, both from the same homeland. 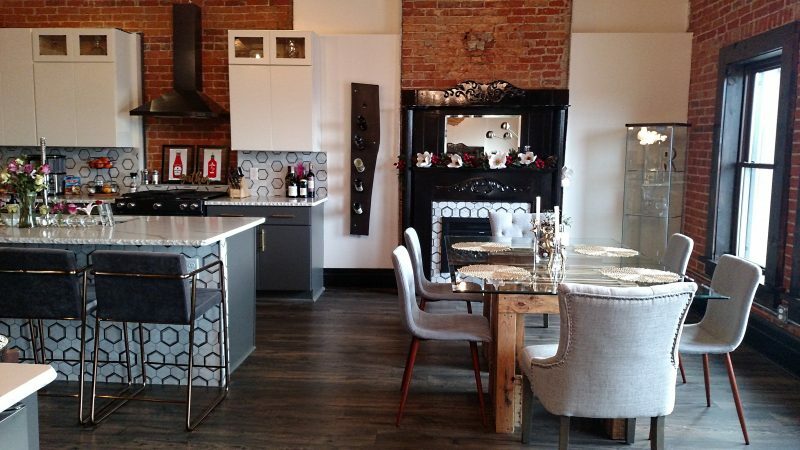 The Hawkes Crystal showroom is at 207 S. Washington St. Hours are 10 a.m.-5 p.m. Monday-Friday and 10 am.-1 p.m. Saturday. For more information, email www.hawkescrystal.com, email hawkescrystalusa@gmail.com or call (419) 448-4286.